Reiki. How did this beautiful energy-based healing modality find its way into this Ukrainian farm girl's life? The answer is simple: It has always been there. Reiki is the practice of using the energy or universal life force that exists in everything to clear and rebalance our body's energy fields. Much as a waterway can get plugged or sluggish if there are obstructions, our body has many energy meridians which allow a natural, immune system-supporting flow. Blockages can be caused by physical injuries, emotional or mental trauma and even spiritual dischord. It's alot like "The Force" in the popular Star Wars movies. This life force energy, when restored to a healthy flow, supports us and allows our bodies to heal themselves and function at their optimum ability. I started learning about Reiki so that I could use it as another "self-help" healing modality for myself and my family. I also enjoy using essential oils, homeopathic remedies and crystals/gemstones therapeutically. We grow a lot of our own food, and source the rest of it through local farmers. Our family takes a proactive approach to health care, believing that it is beneficial to prevent problems and minimize health risks. Right from my Level 1 beginnings, I felt connected to this practice. The concept resonated with me. When receiving Reiki or sharing it with friends and family, I could see and feel the difference after a treatment. I love the look on someone's face who has just had a 45 or 60 minute session - total bliss. "Wow" is commonly heard. Their body language tells me that they have released much of their tension, anxiety and stress. Pain, if it was present before the treatment, often seems to lessen - or even disappear completely. Sounds a bit "woo woo", right? How does it work? Just think about how you feel when you're feeling down and you receive a warm hug. What about how a beautiful piece of music or artwork can lift your heart or bring tears of joy to your eyes? How do you explain that? Energy. Beautiful vibrational energy that is being picked up by your body's energy field. Everything resonates, which is why we can receive a "lift" from so many things. It's also why everything can be improved and brought back to an optimum balance. At home, everything and everyone receives Reiki: our pets, my garden plants, and my family. Although it started as a healing modality for me, my Reiki practice has become a life path. I feel more grounded. I feel I have a purpose and a connection to all things and all people. Being able to be of service to others fills my heart with much gratitude. Each time Reiki is shared and I see the results I am exhilarated and overjoyed. I am very interested in helping Reiki (and other complementary alternative modalities) find their way into traditional medical settings. Its non-invasive supportive results can complement the work of conventional health care. By supporting the body while it receives other treatments (ie. medications, chemotheraphy, physiotherapy, etc. ), Reiki can speed up the healing process, or alleviate some of the side effects of some conventional treatments (nausea, depression, etc.). This holistic approach makes a lot of sense to me. 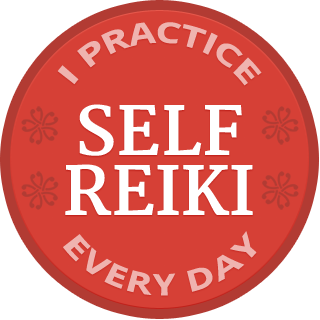 With every book I read, every Reiki blog I explore, every Reiki share I attend, and every Reiki treatment I give, I realize that I want to continue learning more and sharing it with as many people as possible.